With global launches of the Princess 49 and V58 Deck Saloon and show debuts of the Princess 30M superyacht, 75 Motor Yacht and V58 Open, Princess Yachts has seen a significant increase in footfall, prospect conversations and sales during the Cannes Yachting Festival, Southampton Boat Show and Monaco Yacht Show. Antony Sheriff, Executive Chairman of Princess Yachts, added: "We are really pleased that the autumn shows and the past few weeks have resulted in over £70 million in terms of retail sales being generated bringing our order book to over £280 million, the strongest forward orders since before the global financial crisis struck our industry in 2008. This success validates our strategy and customer approach, providing a solid base for our unprecedented £55 million investment programme in products and facilities over the next three years. Our interaction with clientele all across the world via our industry leading distribution network is extremely positive, and it feels like the entire industry has bounced back." 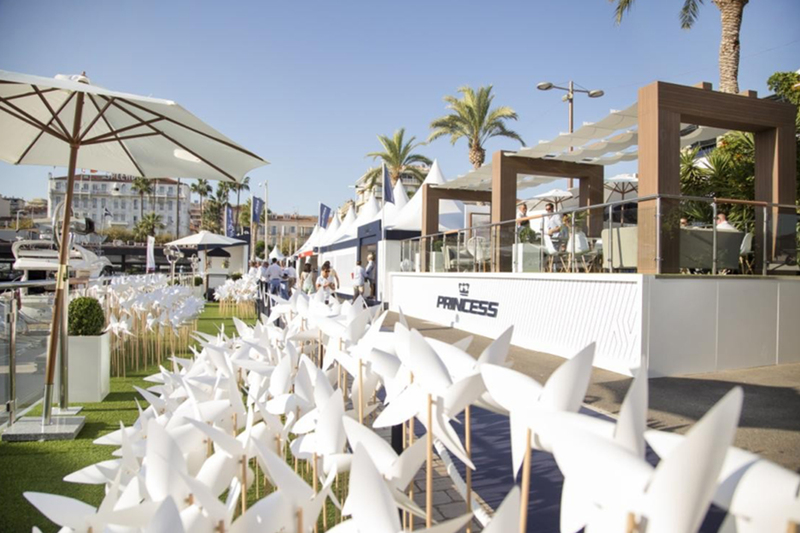 It was hot and sunny, busy and vibrant during the start of the autumn season shows which Princess capitalized on resulting in yacht sales across the range totalling approximately 20% of the total forecast annual sales. The heartland of the Princess brand, being true to its naval and maritime heritage and profiting from its wealth of local ship-building skills, was brought to life with the ‘Crafted in Plymouth, England’ campaign. At least 80% of every yacht is produced in the city by highly skilled craftsmen and women with impeccable attention to detail. Princess created an experiential and tactile stand by utilising materials such as leather, fabric and wood used in the manufacture of the yachts. There were also fields of windmills turning gently in the breeze – each arm of which signified each and every member of dedicated staff at Princess. The recently launched suite of factory film vignettes, ‘Inside Princess’, were displayed on screens and could be viewed through telescopes looking out over the water. The films gave great insight for visitors, customers and press alike into the flawless skill and craftsmanship afforded by the shipyard in a truly emotive way. A new relationship with Plymouth College of Art proved to add a beautiful creative twist with their LIVE : MAKE philosophy as the stand featured an art installation designed and created by 2 graduates depicting yacht layouts made from the actual wiring found in a Princess 40M. Global brand partnerships continue to flourish and were further enhanced through a special new addition. 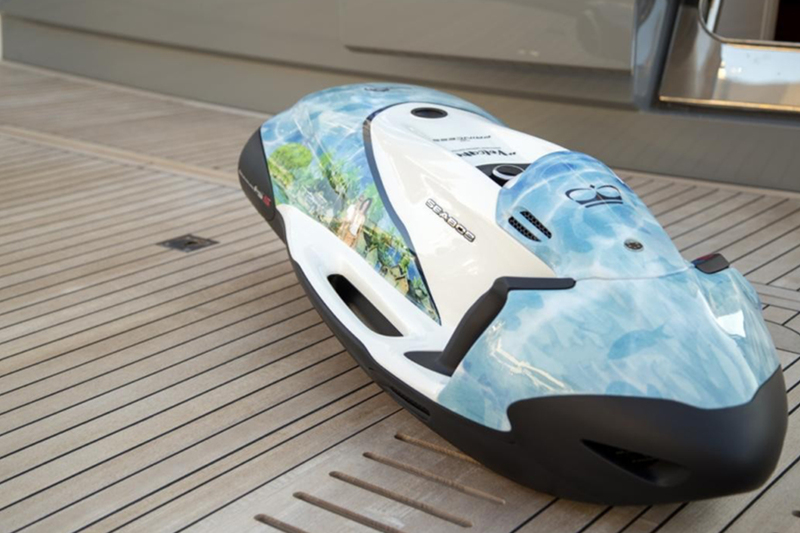 Princess Yachts is the first luxury motor yacht brand to work with and support the Marine Conservation Society, with the creation of a children’s book, ‘Enid & Her Magic Yacht’, illustrated by world-renowned artist Jaume Vilardell. These stunning playful illustrations were also incorporated onto the new limited edition ‘Volcano’ Seabob F5 S. Proceeds from the sale of the children’s book and €345 from the sale of each Seabob go to the Marine Conservation Society to help preserve coastal habitats, sustainable seafood programmes and marine life. Further global partnerships with Plymouth Gin and Bentley Motors also help solidify the crafted in Plymouth, England, messaging and the British luxury brand cues.